To reserve a seminar date for your company please contact Jim Loewke at 585-647-9350 - click here to download a registration form. Loewke & Brill Consulting Group provides a workshop in which we teach people in all facets of the construction industry survival in today's complex, litigious and misinformed "Construction Manager" industry. We teach the most comprehensive explanation of contractor's rights and remedies under the contract. 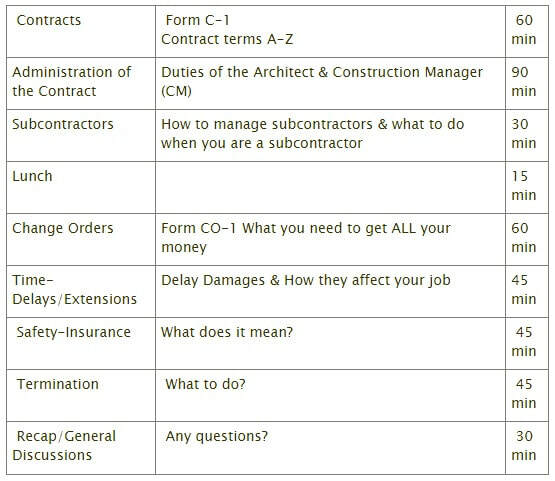 We provide and explain in detail (in construction lingo) the actual laws of the industry. We also offer alternative ways to save money, increase cash flow, and shorten collection time.